History of the Domaine: Enoteca Bisson was born in 1978 when Pierluigi Lugano fell in love with the wines of the Ligurian coastline. He began as a trader in small lots of bulk wine, later became a wine merchant and finally a winemaker in his own right. He now splits his time between his busy wine shop and wine cellar. He works hand in hand with local growers from pruning to harvest then carefully vinifies the different lots of grapes. Pierluigi is a serious student of oenology and is an expert on the local grape varieties. His passion extends to the preservation of local traditions and this is reflected in the distinctive character and personality of his large range of wines from the Cinque Terre region. Composition of the Domaine: It takes a heroic effort to cultivate vines on the steep slopes of the Ligurian coastline high above the Mediterranean Sea. Mechanization of vineyard tasks is out of the question, everything must be done by hand. Only truly passionate winegrowers are willing to carry on the traditions that have come down through the generations since the ancient Greeks first planted vines on the steep, stony slopes here. Lugano works closely with several small, local growers. He believes, as we do, that wine is made in the vineyards and he closely controls the work done in the field. Further, he has embarked on an ambitious program to purchase his own parcels in prime zones throughout the Cinque Terre and surrounding areas. He staunchly defends indigenous, and increasingly rare, grape varieties and works tirelessly to ensure that they do not disappear for future generations of wine lovers. Method of vinification: The small, but very well equipped, cellar is designed so that each lot of grapes can be vinified individually. With the exception of an occasional experiment with barrel aging, Lugano vinifies his entire range of wines in stainless steel to preserve the essential fruit of each vineyard site and each grape type. 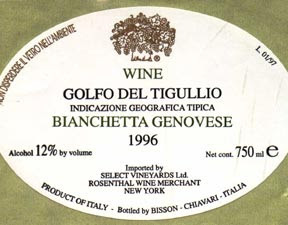 Lugano's Bianchetta Genovese, known as "U Pastine" (local dialect indicating a very special product), comes again from a rare white grape found only in northwestern Italy. Pierluigi has saved several parcels from extinction and creates a truly unique white wine that is quite broad-shouldered and satisfying. This 100% Bianchetta Genovese has a pale gold color with bright golden reflects. Slightly undistinct, a bit difficult to describe, but my impressions on the nose were: a touch old, a bit oxydative, a touch mineral, not too expressive at first, gradually I could smell notes of golden apple, ripe pear and flowers (but difficult to really be precise on this one...). After a few minutes, fresh hay, honey suckle and white flowers with mineral hints were the predominant aromas. The palate is intriguing and interesting, not your everyday wine for sure but worth trying, a bit esoteric and earthy. The attack is good and rich, leading to an even fuller mid-palate, revealing a plain mouthfeel with earthy flavors of ripe golden apple, hay, almond and floral and mineral notes, almost sherry-like in the palate but fatter. Overall, unusual and intriguing, a must try for esoteric wine lovers. Slightly oxydise notes and quite dry on the finish, not a sipper but definitely a food friendly white wine balanced with very good acidity, medium to full intensity, with almost a tannic sensation in the back. Have it with really earthy, slightly unsual dishes based with fish or white meats or even with a Ratatouille.